It's been a while since I've checked in. This week was hectic starting with the visits to the publishing houses on Monday and Tuesday, BEA on Wednesday and Thursday, and the first Book Blogger Convention on Friday. I was running around with irregular meals and little sleep; I somehow caught the flu. 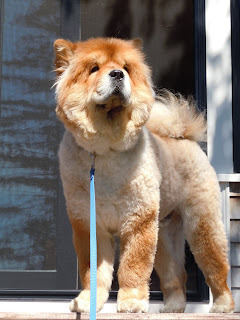 In the meantime, here's a picture of Ramey, my uncle's chow and one of the friendliest dogs I know. Ramey lives in Boston & in Gloucester, MA. He was having a hard time coping with the heat, so he had his first short cut. He's feeling much more himself now! More news on BEA, the publishing house tours, and the Book Blogger Convention soon. In the meantime, I hope everyone has a wonderful Memorial Day weekend! Oh no, Gaby! Sorry you're sick ... hope you feel better soon. On a brighter note, I'm so glad I had the chance to meet you over breakfast at the Book Blogger Convention on Friday!